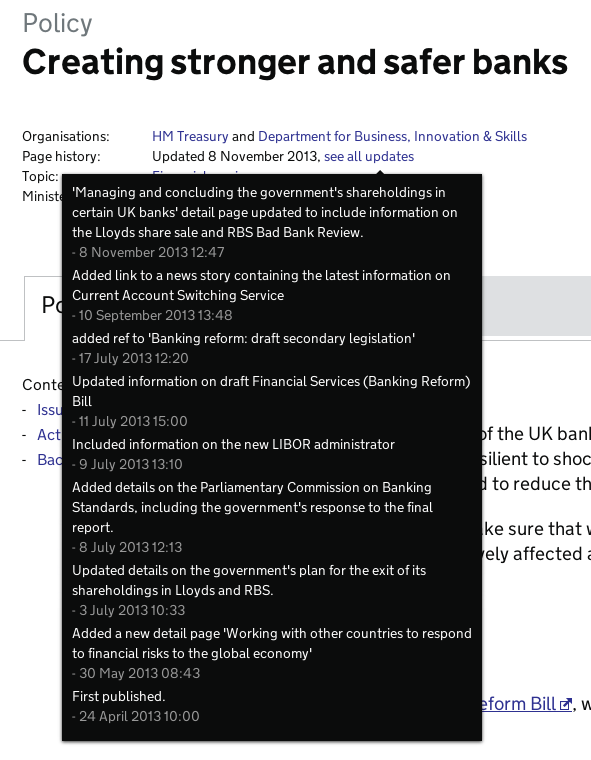 Since it launched nearly a year ago, the departments and policy section of GOV.UK has included a publicly viewable change history on all pages, including a note from the editor as to what has changed (a bit like a Git commit message). Example of public page history "change notes"
Publishers can choose whether an update is substantive enough to warrant all the above things happening, or whether it's a minor change which should bypass all that. (For example, notifying email alert subscribers each time you fix a broken link or typo is just annoying). However, we've seen lots of examples of people being confused by this - for example mistaking the "change notes" for an internal comment, or alerting users to minor things such as adding new metadata. So we've looked at how we can tweak the interface to make things clearer. It's a small change, but we hope publishers will find this much clearer, and that it will eliminate the mistakes we sometimes see.